Some common hazardous wastes that businesses can accumulate. With the prevalence of various chemical products in use in the world today, it’s inevitable that some of them will become wastes that require disposal. Since not all chemical wastes pose the same amount of danger to public health and the environment, the Environmental Protection Agency has established standards that distinguish which chemical wastes are considered hazardous. Any waste that is deemed to be hazardous requires special handling, documentation and disposal. Just like how all waste are not the same, not all waste generators are the same either. The EPA has created three categories for generators of hazardous waste and any generator disposing of wastes that are considered hazardous will fall into one of the three. Businesses that only generate small amounts of hazardous wastes, meaning less than 220 pounds or roughly 25 gallons, per calendar month are considered to be conditionally exempt small quantity generators (CESQG). Since many businesses including auto repair shops, retailers, painters and other service companies can create small amounts of hazardous waste on an infrequent basis, the EPA has created less stringent standards for these conditionally exempt generators. Any hazardous wastes from conditionally exempt generators must still be disposed of through licensed transporters and disposal facilities but the generator can forego most of the complicated reporting and storage requirements that generators of larger quantities of wastes must follow. Some states may have their own regulations regarding CESQG’s but Texas generally does not require any reporting from non-industrial generators who dispose of hazardous wastes if the quantity is below the limit established by the EPA. If a conditionally exempt generator in Texas exceeds the CESQG limit in any particular month due to a rare event, they may need to file for a One-Time Shipment permit and report the disposal to the TCEQ. If your company anticipates generating any hazardous wastes, it’s best to have a plan in place before wastes begin to pile up. 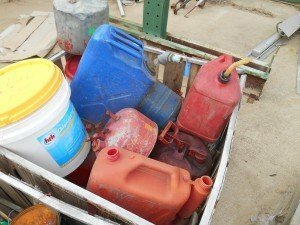 Managing hazardous waste in a timely and organized fashion means limiting your liability and the risk of spills, accidents or fines from regulators. Protect Environmental can help your company determine your generator status and find a strategy for storing and disposing of wastes that fits your needs so feel free to contact our office to learn more.